Photo: India Minister for Human Resource Development, Prakash Javadekar, releasing the India Rankings 2018 for Higher Educational Institutions at a function in New Delhi on April 03, 2018. The University Grants Commission Chairman and the Minister of State for Human Resource Development are also seen. New Delhi, India. April 03, 2018. 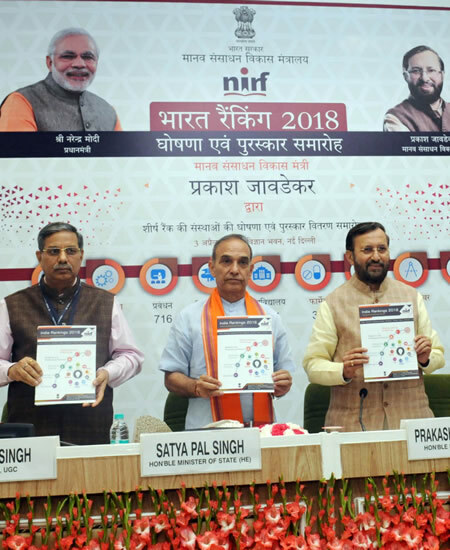 In a programme held in New Delhi today, India’s Human Resource Development Minister, Prakash Javadekar, released the National Institutional Ranking framework (NIRF) India Rankings 2018 in various categories on the basis of performance of Higher Educational Institutions. Speaking on the occasion, Prakash Javadekar said that the idea behind these rankings is to promote quality in education and encourage competition to perform better and to set up new benchmarks of performance in Higher education space. While Indian Institute of Science, Bengaluru bags 1st Position in Overall Ranking, IIT Chennai tops in Engineering, and IIM Ahmedabad tops in Management Category.